The Story of "Vet's Canes"
The Studio is called "CedarStump". Denny Bell carves his unique artwork at his studio on the banks of the Des Plaines River in Southeast Wisconsin. 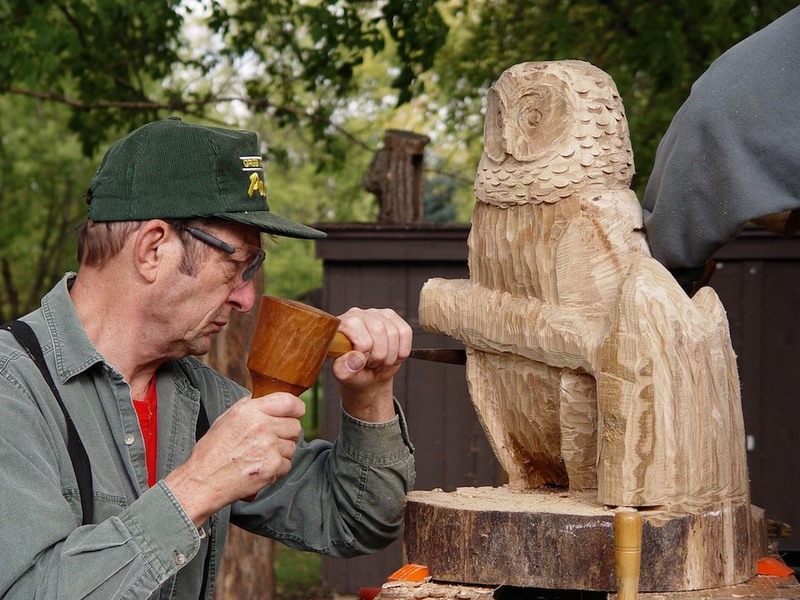 Although primarily self taught, he has attended classes at various workshops taught by top carvers across the Midwest. A frequent contributor to the "Artists Corner" at the Kenosha Public Museum, he has recently been encouraged to begin teaching his art to others. His work, from Realistic Wildlife to Old World Santa's to Restoration Carving, is among the best to be found and is in private collections across the country. Working with both hand and power tools, Denny transforms a rough block of wood into a piece of art for the living room or yard. He has completed several chainsaw carvings and antique "smoothie" decoys which decorate homes and yards across the country. Although he does painted pieces, he prefers to use the natural beauty of woods like Black Walnut, Cedar, Oak, Butternut & Catalpa in his work. While preferring Wildlife and nature oriented subjects, recent additions to his portfolio include several architectural pieces for clients in Texas and Wisconsin. Examples of his work can be found in the "Wood Carvings" section of this site or by appointment at his studio.